All of the following prices are for using premium grade tanalised timber painted using Profilan Impra Opac paint. Our prices include everything you see - from foundations to finials, including guttering and shelving. There are no hidden extras - and allows for construction wherever you are - from Inverness to Cornwall and anywhere inbetween. Want something different - just ask. This is only a selection of many available sizes and designs. All prices include VAT (there's nothing more to pay). Accoya adds roughly 20% to the total costs given below. Accoya timber carries a 50year guarantee against rot, insect attack, and is stable (no warping/twisting/expanding) and a life expectancy of at least 60 years. A detailed quotation for this type follows below....just scroll down to the bottom of the page for a comprehensive specification of all this includes. 3m wide (including porch) by 4m long - with a DOUBLE-GLAZED ROOF. 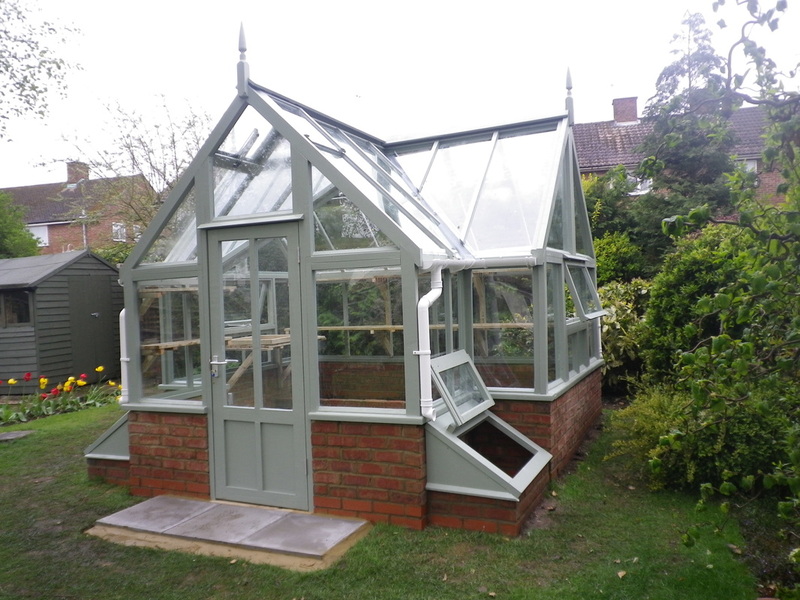 Rather than "aspirational" names like "The Balmoral" or "The Buckingham" I decided to name them after the first person I built that particular type of greenhouse for. I've just been asked to combine a 'Miriam' with a 'Steve' to make a 'Vernon'....and Richard's pleased as I'd never built a 'Richard' before. A typical quotation in detail. The details below are the specifics of a quotation - they aim to show all the detail behind what you actually get when we say "from foundation to finials". Lay 2 courses of engineering bricks – acting as a damp proof course protecting heritage style brickwork above from possible rising ground water. Lay 5 courses of heritage facing bricks (Terca Cassandra or similar quality “hand-made” style) finished with brushed pointing in keeping with period style. 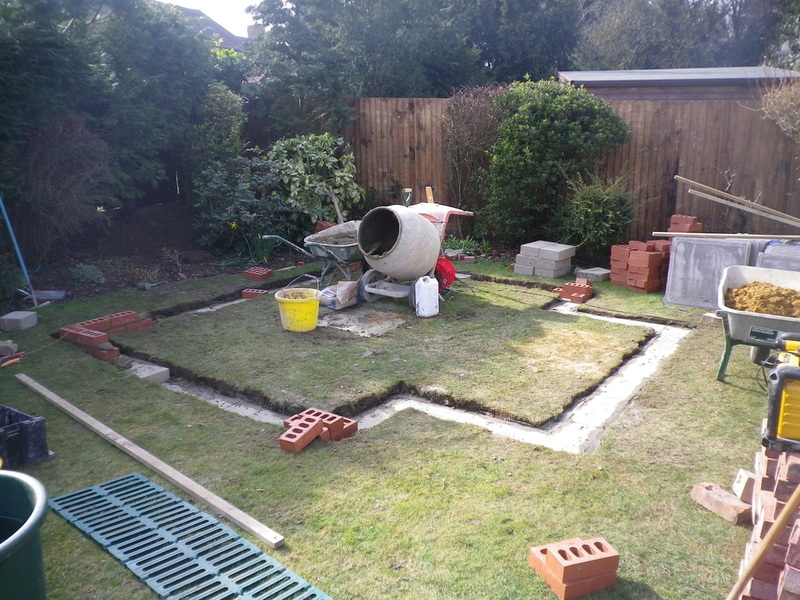 To clear turf from interior and level ground before adding sand screed over weedblock sheeting and laying concrete slabs to form flooring stopping some 12inches short of wall. 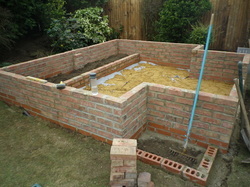 Edging to be filled with gravel – useful run-off for washing down interior and standing pots. 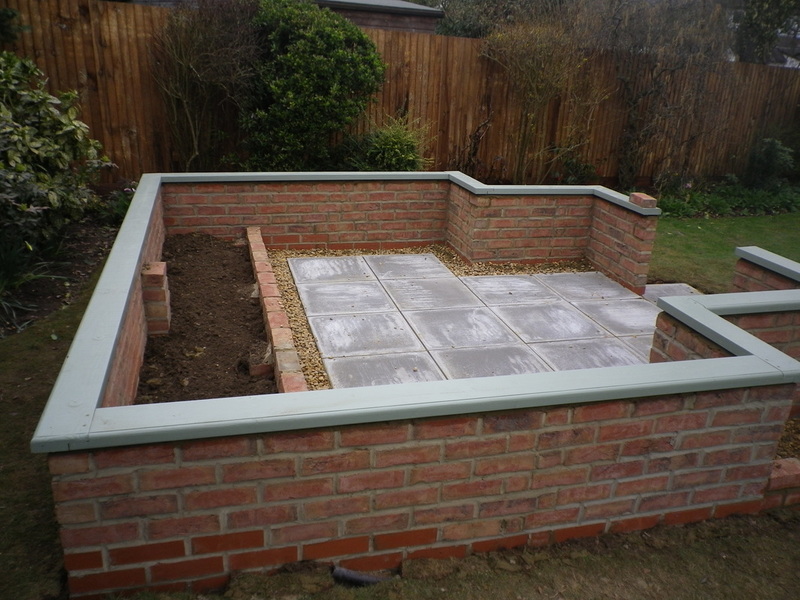 To construct two brick sided cold frames either side of porch laid on concrete foundations as per above specification for rest of greenhouse structure (this one also included an internal raised bed). Including two manual opening windows in vertical gable ends of structure including window stays. Hinges for all to be stainless steel ball-bearing hinges for long durability. To apply two liberal coats of Impra Opac micro-porous breathable paint in colour of customer’s choice. To supply and fit white uPVC half round guttering including downpipes and shoes to three sides. To supply and fit tanalised timber staging – two levels along full length of rear elevation comprising removable sections of shuttered shelves for flexibility.